Hans Leijnse was born in Amsterdam in 1961. From an early age he showed much interest in marine life. As a child he sat hours with his nose pressed to the glass of his father’s aquarium, completely taken up with this miniature underwater world in the living room. No surprise then, that at 16 years of age he took up diving, and after receiving all his diving and instructors certificates the interest in underwater photography began. The photos from his first photography dive in the Red Sea in 1982 were already of high quality and very recognizable. Hans has won many national and international prizes over the years, demonstrating the very high quality of his work. Hans has a particular interest in the waters of the Netherlands, and dives regularly in his favourite photography sites in Zeeland, the Oosterschelde and the Grevelingenmeer. Biologists consider the Oosterschelde as one of the richest underwater areas in the world. In his daily life, Hans is a physiotherapist, and together with his wife, they run a practice in their hometown of Amstelveen. Besides the Netherlands, Hans has photographed in the following coutries and areas: the Red Sea, Norway, Brittany (France), Great Britain, Spain, Italy, Croatia, Bonaire, the Cayman Islands, Florida (USA), the Philippines, Manado and Papua (New Guinea) Indonesia, and the Maldives. Hans photographs with Nikon cameras in Subal underwaterhousings. 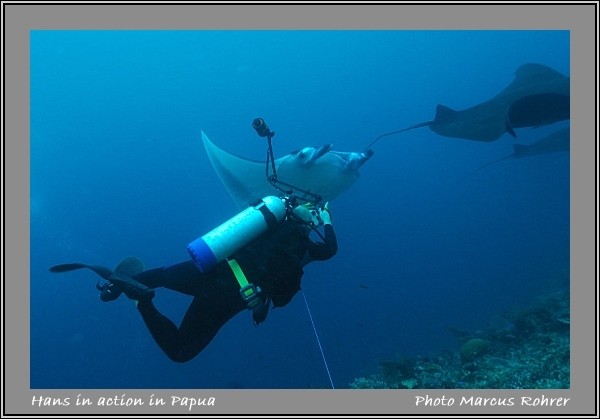 The quality of this combination is reveald in the more than 2000 photo dives he has made.